Preheat oven to 350 degrees. 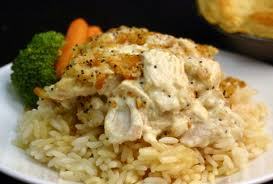 Place chicken in shallow casserole dish. Mix sour cream and soup; pour over chicken. Mix Ritz crumbs & poppy seeds with butter. Sprinkle over the top. Bake for 30 minutes. Serve over wide egg noodles, rice or by itself. *Note: Peggy sometimes serves this prepared with whole, uncooked chicken breasts. When she does this, she increases baking time to approx. 60 minutes.